The dsp.FilterCascade object creates a multistage System object™ that enables cascading of filter System objects, delays, and scalar gains. This object operates similar to the cascade function. However, the cascade function does not support delay as a filter stage. You can pass the dsp.FilterCascade System object as a stage to another dsp.FilterCascade System object. You can also pass dsp.FilterCascade System object as an input to the cascade function. When you call the object, the size, data type, and complexity of the input signal must be supported by all of the stages in the filter cascade. This object supports variable-size signals if the stages within support variable-size signals. Create the dsp.FilterCascade object and set its properties. Alternatively, you can generate a MATLAB® function from the filter cascade object, and call that function to filter a signal. The generated function supports C/C++ code generation. See generateFilteringCode. FC=dsp.FilterCascade returns a System object, FC. This System object has a single stage, the dsp.FIRFilter object with default properties. FC=dsp.FilterCascade(filt1,filt2,...) returns a multistage System object, FC, with the first stage set to filt1, the second stage set to filt2, and so on. Each stage can be a filter System object , a dsp.FilterCascade System object, a dsp.Delay System object, or a scalar gain value. To change the number of stages in a cascade, use the addStage and removeStage functions. y=FC(x) filters the input signal x using the filter cascade defined in FC, and returns the filtered output, y. The size, data type, and complexity of the input signal must be supported by all of the stages in the filter cascade. This object supports variable-size signals if the stages within support variable-size signals. Data input, specified as a vector or a matrix. When the input is a matrix, each column of the matrix represents an independent data channel. Note: This example runs only in R2016b or later. If you are using an earlier release, replace each call to the function with the equivalent step syntax. For example, myObject(x) becomes step(myObject,x). 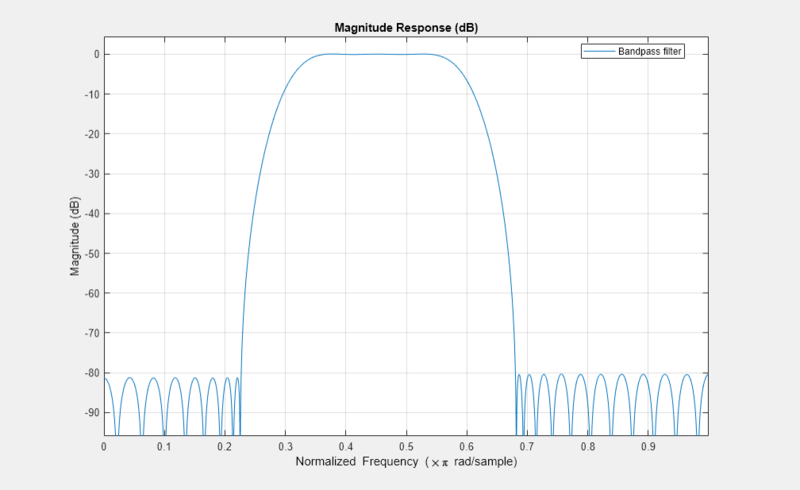 A highpass filter with a stopband frequency of 5000 Hz and a passband frequency of 8000 Hz. A lowpass filter with a passband frequency of 12,000 Hz and a stopband frequency of 15,000 Hz. 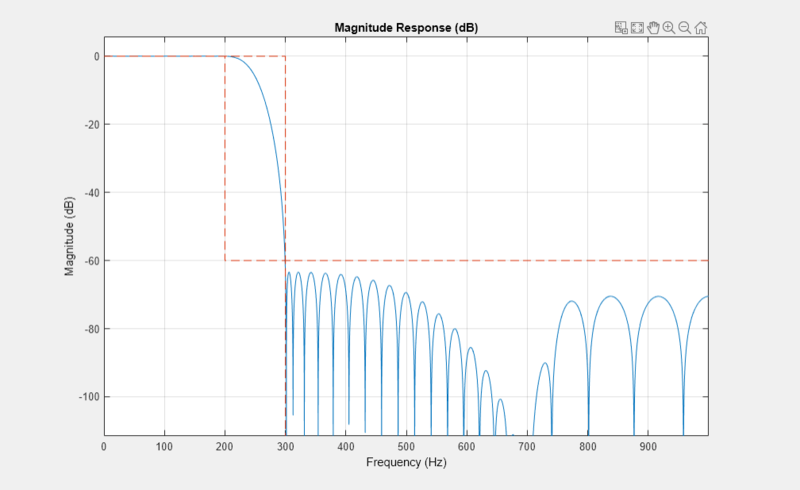 Visualize the frequency response using fvtool. Pass a noisy sine wave as the input to the bandpass filter. The input is a sum of three sine waves with frequencies at 3 kHz, 10 kHz, and 15 kHz. The sampling frequency is 48 kHz. 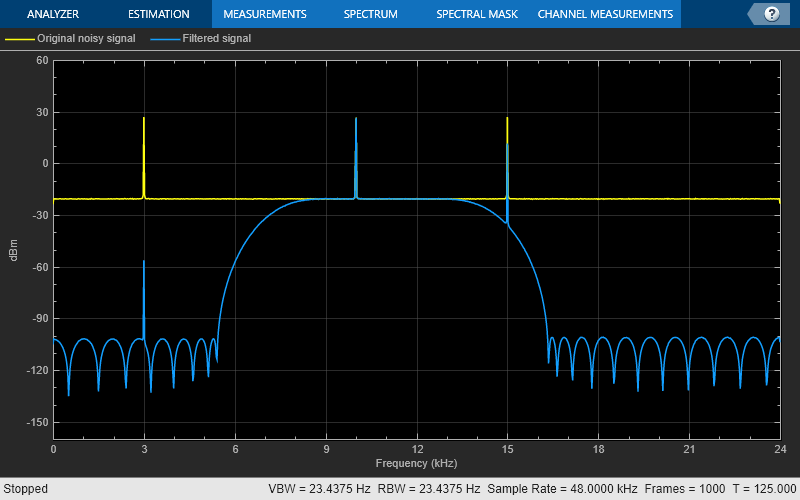 View the input and the filtered output on a spectrum analyzer. The tones at 3 kHz and 15 kHz are attenuated, and the tone at 10 kHz is preserved by the bandpass filter. Create a CIC decimator. Cascade the decimator with a gain. Design a compensation decimator and cascade it with the filter cascade, decimcasc. Visualize the frequency response of the cascade of cascades. The CIC compensation decimator has an inherent gain, gain(cicdecim). By cascading with a factor of 1/gain(cicdecim), the filter cascade compensates for this gain. 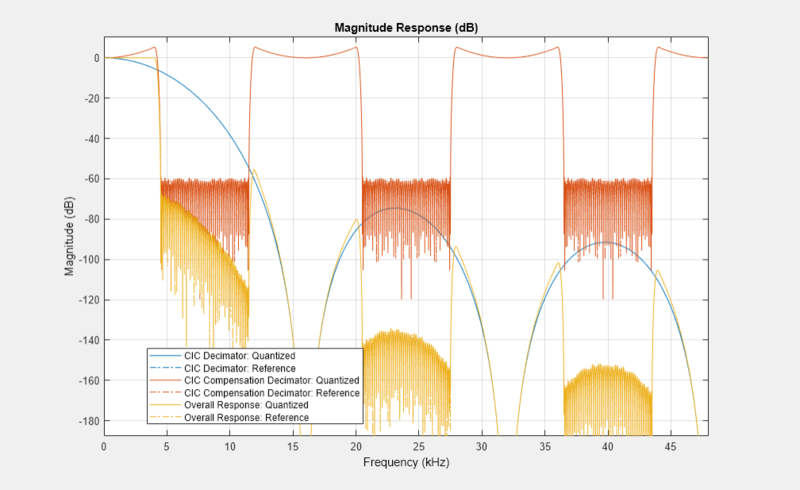 Design a two-stage decimator with a 100 Hz transition width, a 2 kHz sampling frequency, and 60 dB attenuation in the stopband. The decimator needs to downsample by a factor of 4. Verify your design using fvtool. Generate code to filter data using this design. The code is saved in a file called stepDecimator.m in the current directory. The stepDecimator function creates a filter cascade and calls the step method on each stage. % Generated by MATLAB(R) 9.6 and DSP System Toolbox 9.8. % To generate C/C++ code from this function use the codegen command. % Type 'help codegen' for more information. You cannot generate code directly from dsp.FilterCascade. If the filters in each stage support code generation, you can generate C/C++ code from the function returned by generateFilteringCode.